The Crafty Pint may never have eventuated were it not for a cold, dark Melbourne winter's evening when a couple of Brits, recently arrived in Australia, climbed into an old Mercedes outside The Greyhound in St Kilda. It was being driven by a woman who'd told one of them "my boyfriend works for a microbrewery" and had thus opened up the promise of finding good beer Down Under. 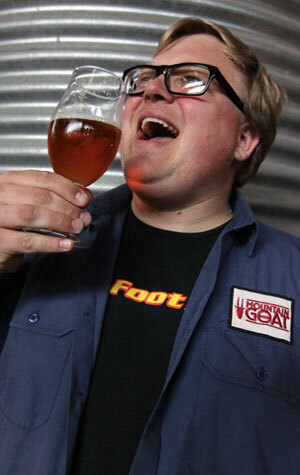 Said boyfriend (now husband) was Tom Delmont, the larger-than-life On-Road Goat, and walking into the Goat brewery that night was something of an epiphany moment for The Crafty Pint's founder. Six years and one website later, this legend of the local craft beer world has had a beer brewed in his name, his honour and his likeness. Those who know Tom know it could only ever have been one style: a West Coast IPA, and so it is, crammed full of US hops Cascade, Amarillo, Simcoe, Centennial and Chinook.